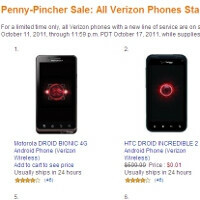 In case you haven't seen it already, Amazon has Verizon's whole cell phone lineup for grabs at the price of a penny each. Yes, that includes phones that are normally $299, like the Motorola DROID BIONIC. So if you are planning to tie the knot with Verizon for the next two years anyway, Amazon's generous pricing scheme will come in handy. Moreover, you have the regular free two-day shipping treatment, and the whole "Penny-Pincher" offer expires on October 17. I'd much rather pay $200 for Nexus Prime on T-Mobile, than pay 1 cent for any phone on Verizon, what you save on the phone they will earn back x10 on your overpriced VZW plan. it sure is. but it's worth it because verizon's service and coverage are unaparelled. i heard the prime will also go to sprint but not at the same time with vzw. you might wanna try them as well. they have a great future ahead of them.. It really depends on the area, I travel throughout the country, and worldwide and I carry a Verizon phone for personal use and a Sprint phone for work and speeds vary greatly on both networks depending on the area, this applies to 3G and 4G. For instance, in my home market, I get around 800kbps - 1.2mbps consistently on Sprint 3G while I only get between 300kbps - 700kbps on Verizon. As far as 4G, I am seeing slightly better speeds on Verizon, around 8mbps - 11mbps where sprint is giving me 6mbps - 8mbps consistently. I have yet to see the crazy Verizon 4G speeds around 20mbps I see few people posting. From my personal experience, Verizon has slightly better coverage than Sprint but not by much, certainly not worth the extra money I am paying for my personal service. I must say, Sprint service is very good and the plans are unbeatable. I am seriously considering going to Sprint for my personal service too. I was also waiting on the Droid Prime, but this Bionic I'm trying out might just be a keeper and for only 1cent. WOW! WHAT A AWESOME BUY !!!! The wireless business is like everything else in life, the best is always the most expensive, T-mobile is cheap, but so is the service that they provide, I had a Galaxy S 4g with T-mobile until 3 months ago. and let me tell you that when you need a reliable phone service Verizon seems cheap. Or you guys can wait for the Droid Razr, from what I'm hearing its better than most devices out there. no thanks, verizon plans for smartphones are too expensive! But it is enticing. $79.99 Unlimited plan that gets throttle at 2GB. :( LOL! Who's heard of that? kenshiro--get the Nexus Prime--if T-mobile get's it....the phone is only good as the coverage you have....Think before you speak! It really doesn't. I don't leave the city very often, when I do it's on a plane. And the times I have driven outside the city, my service with Tmo has been reliable. Also, the same plan on Verizon would run me or anyone else $140, not $99. So enjoy your 450 mins wannabe "unlimited" plan and piss-poor LTE batterly life in your theoretical wilderness situation, while I enjoy a truly unlimited plan with unlimited mins, unlimited texting and unlimited data with no throttling because it's grandfathered, in a 4G enabled HSPA+ 42Mbps city, while still paying $20 less than you per month. Think before you speak. Chump. Oh, and T-Mobile will most definitely get the Prime, there is no "if" about it. And it will be a quad-band GSM world phone with better battery life than whatever VZW is being handed. Read it again. It say starting at a penny. If you are upgrading it will still be big dollars. on order to get the 0.01 you have to make a new contract. Wtf att needs to do this, I keep seeing stuff like this with verizon dammit! So sick of you tmobile fan boys. Tmobile is for poor people and stupid people. You get baited in with cheap plans that have the worst coverage and dropped call ratios. Sprint, your next. Kshell1 was spot on. Their data coverage is ok, but roams a ton, making it slow as hell. They also have poor service for voice and have a lot of dropped calls. Your cell phone and service is an investment, there is NO value in cheap service that doesn't work when you want it or need it. So you may pay 10 or 20 bucks more a month with Verizon but it is well worth it. Wake up people, service is what separates cell companies.